Ready for set and still having fun! I can remember my first job on my first movie and the stunned way that I looked at my new boss as she described how to hold the Polaroid camera to get the biggest shot of the actors and how to read a call sheet. 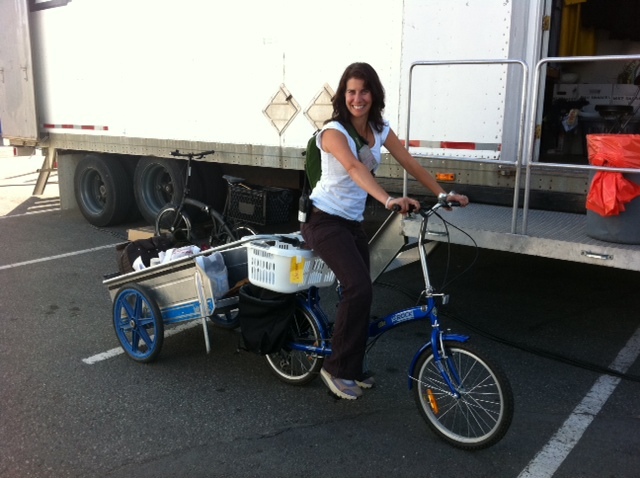 Then she left… day one and I was now in charge of the continuity for all the Costumes, Makeup and Hair… yikes! Now, just over twenty years later, I can laugh at that day. Since then, I’ve worked in every aspect of the costume department from Dresser to Designer and all those jobs in between. I have traveled the world and learned from so many generous people while shooting in places like the Philippines, Paraguay, Dubai and points even further afield. I’ve work on some amazing shows with truly talented coworkers from in front of and behind the camera who have taught me so much. And it’s a good thing too because when I left high school there were no schools or programs for specifically working in film costuming. So I took what I loved; sewing and costuming, and went into the Apparel and Design course at NAIT. I followed that up with a scholarship to the Banff Theater of Fine Arts to specialize in Historical Costuming. In my first years of theater, I worked in the sewing room and I dressed back stage — if you have done both jobs, you know the glares I got from the sewing room folks! My first roles in film were cutting, sewing and doing the truck position. As it was thrown at me I ran with it. I picked up the concepts of continuity as quickly as I could. I learned how to deal with the elements for both the cast and myself, no matter how extreme. I learned breakdown and dying the hard way; if you open too much green dye in a small room… all your underwear is going to be green by the end of the day! And eventually, I fell in love with the challenges of film work. As the film industry expanded, it became my focus. I took the time to break in my set shoes… gave myself the time to build and refine my skill set… and after a few years, I was able to move up and work as a Set Supervisor and Costume Coordinator. It took a while of doing all the different positions, and a few moves from Edmonton to Calgary and finally Vancouver, but I soon realized that I had found my home and my path… Set Supervisor was the right position for me. I still look back and remember it all… the good, the bad and the green dye! Ultimately though, when I really look back, I have my father to thank for where I am today. He worked at a television station in Edmonton and as a child I would get to sit at the back of the sound stage and watch as the cameras, lights and actors danced their dance. I can still remember the actress’ red dress swinging to the melody of the song that she sung while I sat there in the dark and watched. I know now that this is when my choice was made… even though I didn’t know it then. I can only hope that in this blog I will be able to pass on to you some guidance, advice (sometimes what NOT to do!) and most importantly… inspiration. To have true passion in the work you do is wonderful beyond words… but to share it with others is perfection. Hi Dawn! This is a great idea to help future costumers know what they are really getting themselves into. The film/tv industry has so many grey areas – this blog will help a lot of people navigate their way a little easier!!! Well done! PS – what an interesting career! Thanks! I am sorry to say I haven’t looked up much about WW1 on the net but I have read a lot of books about the topic. I really love reading anything on the women in war… Well strong women in everything! If I come across anything in my searches I will forward it on to you. Thank you the awesome info. You came into my work, Fabricland, and gave me your card. Your blog has given me a whole new outlook as to what I need to learn. Thank you so much. I am now even more stoked about attending school in the fall. I look forward to reading more. Thank you so much, it is really great to get some feed back about the blog! It was so wonderful to meet you the other day, please feel free to contact me if you ever have any question! Have fun at school! HI Dawn! I loved working with you this week! Couldn’t have found a better team for my first gig. 14 hours just flew by. I’ve tagged your blog-looking forward to reading every post in detail! Especially interested in the blood article! I was great having you out for the day! I am hoping that we will you again soon!